Vaccines are perisable products and therefore you must select the second day option when ordering. Also vaccine orders are typically delayed when necessary to avoid shipping over weekends. Innervet 4-way for equine Influenza, Eastern & Western Encephalitis, and Tetanus. Killed virus/bacteria tissue culture vaccine that minimizes reactions in horses. Modified live Strangles (Distemper) vaccine by Fort Dodge. Vaccine is administered intra naselly with a special canula. This procedure is tollerated well by most horses but it can be very difficult to administer for some. This vaccine is highly reactive in muscle tissue and therefore should always be given following all other vaccinations and extreme care must be exercised not to contaiminate any IM injections or inadvertantly give in the muscle. Merial's potomac horse fever is a killed Ehrlichia Risticii Bacterin for horses. Equine Rhinopneumonitis (herpes virus) and Influenza Vaccine.Prestige II is a killed virus vaccine for horses. Innervet vaccine made via tissue culture which makes reactions rare. Aids in the prevention of respiratory disease. Innervet 5-way for equine Rhinopneumonitis, Influenza, Eastern & Western Encephalitis, and Tetanus. Killed virus/bacteria tissue culture vaccine that minimizes reactions in horses. Innervet 6-way for equine Rhinopneumonitis, Influenza, Eastern, Western, & Venezuelan Encephalitis, and Tetanus. Killed virus/bacteria tissue culture vaccine that minimizes reactions in horses. Innervet killed equine herpes virus vaccine that aids in the prevention of abortion and respiratory disease associated with EHV 1. Tissue culture vaccine is normally well tolerated. Vaccinate mares at 5, 7, & 9 months of gestation. Purified tetanus toxoid for vaccination of healthy horses, cattle, swine and sheep, 6 months of age or older, against tetanus. Administer IM. Mainly used in horses because Covexin 8 or CD&T vaccines are significantly less expensive for livestock. Recommended for use in domestic animals (horses, cattle, sheep and swine) as an aid in preventing and treating tetanus. Confers immediate passive immunity lasting about 7-14 days. Administer SQ or IV. Use in animal with no history of tetanus immunization that obtain wounds or sole abcesses requiring immediate protection from tetanus. Fort Dodge West Nile combination that also contain Eastern & Western Encephalitis and Tetanus. This is a good vaccine for horses that are fairly isolated and do not need to be vaccinated for respiratory disease. 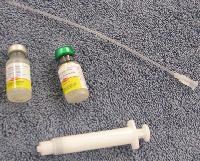 Two doses are required for adequate protection the 1st year followed by an annual booster.